DITRA-XL allows for ceramic tile application over single layer plywood/OSB subfloors on joists spaced at 24” (610 mm) o.c. 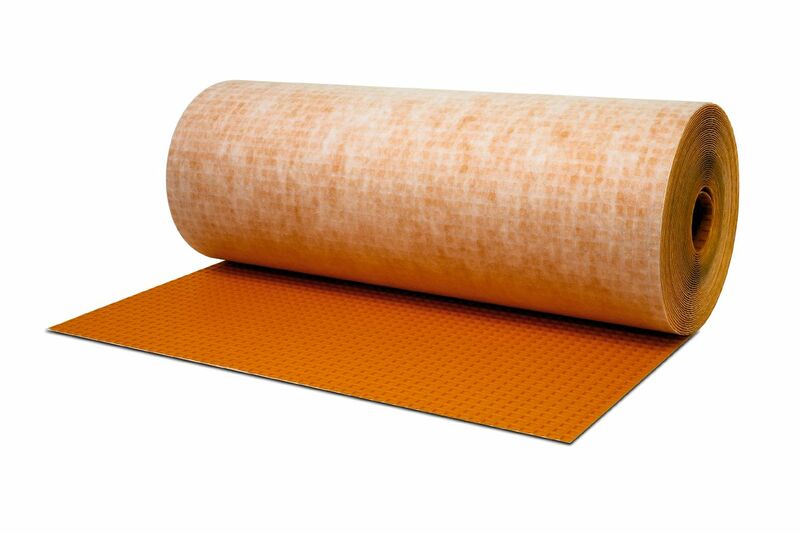 Schluter®-DITRA is a polyethylene membrane with a grid structure of square cavities, each cut back in a dovetail configuration, and an anchoring fleece laminated to the underside. The anchoring fleece is embedded in thin-set mortar to provide a mechanical bond to the substrate. Tile is installed over DITRA using the thin-bed method in such a way that the mortar becomes mechanically anchored in the square, cutback cavities of the matting. 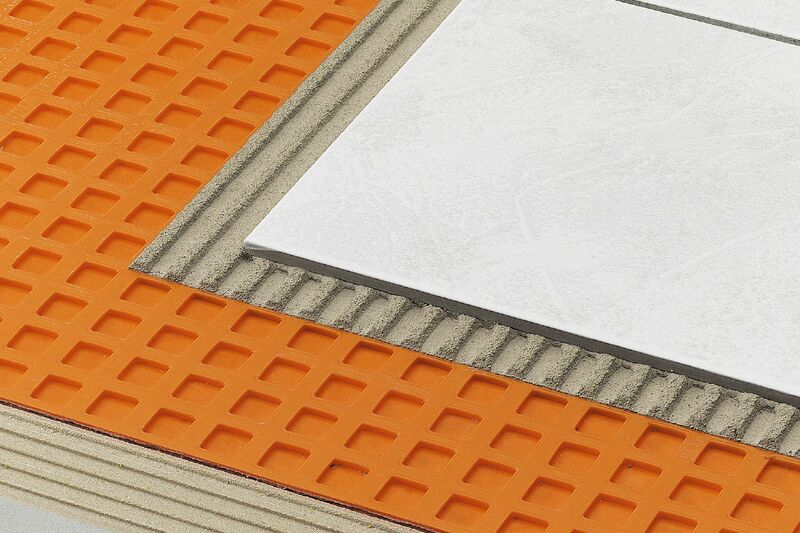 Designed specifically for ceramic tile and dimension stone installations, DITRA serves as an uncoupling layer, waterproofing membrane, and vapor management layer that accommodates moisture from beneath the tile covering. Further, DITRA performs all these functions while still providing adequate support/load distribution for the tile covering. The combination of these four essential functions allows for the successful installation of tile over a wide range of substrates, including plywood/ OSB, concrete, gypsum, heated floors, etc. DITRA is 1/8" (3 mm) thick, which minimizes tile assembly thickness and reduces transitions to lower surface coverings (e.g., carpet, engineered wood, and vinyl). DITRA allows for ceramic tile application over single-layer plywood or OSB subfloors on joists spaced up to 19.2" (488 mm) o.c. Tile has been successfully installed for thousands of years by incorporating an uncoupling layer, or forgiving shear interface, within the tile assembly. DITRA provides uncoupling through its open rib structure, which allows for in-plane movement that effectively neutralizes the differential movement stresses between the substrate and the tile, thus eliminating the major cause of cracking and delaminating of the tiled surface. DITRA provides reliable waterproofing in interior applications. Its polyethylene composition protects the substrate from moisture penetration, which is particularly important in today’s building environment where most substrates are moisture-sensitive. The distinguishing feature of DITRA is the existence of free space created by the configured channels on the underside of the matting. The free space provides a route for excess moisture and vapor to escape from the substrate that could otherwise cause damage to the tile layer above. Thus, DITRA effectively manages moisture beneath the tile covering. 1. Using a thin-set mortar that is suitable for the substrate, apply the thin-set mortar (mixed to a fairly fluid consistency, but still able to hold a notch) using a 1/4" x 3/16" (6 mm x 5 mm) V-notched trowel, 5/16" x 5/16" (8 mm x 8 mm) V-notched trowel, or the DITRA trowel, which features a 11/64" x 11/64" (4.5 mm x 4.5 mm)square-notched design. 2. Apply DITRA or DITRA-XL to the floor, fleece side down. Solidly embed the matting into the mortar using a float, screed trowel, or DITRA-ROLLER*, making sure to observe the open time of the bonding mortar. If the mortar skins over prior to matting installation, remove and reapply. Note: It may be helpful to back roll the end of the matting before installation, or place boxes of tile on top of the matting after installation, to avoid curling. *When using the DITRA-ROLLER, place a weight (e.g., bag(s) of mortar/grout or box of tile) not to exceed 75 lbs on the DITRA-ROLLER shelf. Slowly move the roller from one end of the matting to the other, slightly overlapping successive passes. 3. Lift up a corner of the matting to check coverage. Proper installation results in full contact between the fleece webbing and the thin-set mortar. Simply abut end and side sections of adjacent sheets. Note: Coverage may vary with mortar consistency, angle at which the trowel is held, substrate flatness, etc. If full coverage is not achieved, remove and reapply, making sure to verify proper mortar consistency and application. 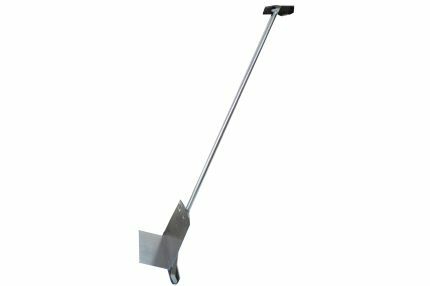 In some cases it may be beneficial to use a trowel with larger notches, such as a 1/4" x 1/4" (6 mm x 6 mm) square-notched trowel for DITRA-XL. 4. Tile can be installed over DITRA and DITRA-XL immediately; no need to wait for the mortar to cure. Fill the cut-back cavities with Schluter-SET, Schluter-ALL-SET, Schluter-FAST-SET, or unmodified thin-set mortar and comb additional mortar over the matting using a trowel that is appropriate for the size of the tile. Solidly embed the tiles in the setting material. Periodically remove and check a tile to ensure that full coverage is being attained. 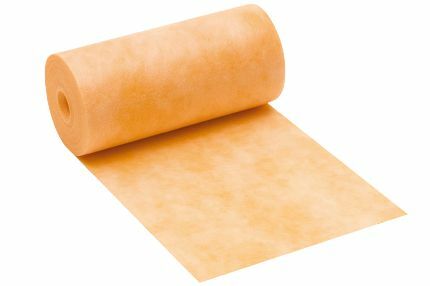 Back-buttering is a useful way to help ensure proper coverage, particularly when installing large-format tiles (e.g., 12" x 12" (305 mm x 305 mm) and larger). Note: To bond DITRA and DITRA-XL to the substrate: Use one 50 lb. (22.68 kg) bag of mortar per 150 - 200 ft2 (13.9 - 18.6 m2). To bond the tile to the DITRA, using a 1/4" x 3/8" (6 mm x 10 mm) square- or U-notched trowel: Use one 50 lb (22.68 kg) bag of mortar per 40 - 50 ft2 (3.7 - 4.6 m2). To bond the tile to the DITRA-XL, using a 1/4" x 3/8" (6 mm x 10 mm) square- or U-notched trowel: Use one 50 lb (22.68 kg) bag of mortar per 35 - 45 ft2 (3.3 - 4.2 m2). 1. At the joints, fill the cut-back cavities with Schluter-SET, Schluter-ALL-SET, Schluter-FAST-SET, or unmodified thin-set mortar, approximately 8" (203 mm) wide, centered over the joint. 2. Comb additional Schluter-SET, Schluter-ALL-SET, Schluter-FAST-SET, or unmodified thin-set mortar over the joint using a 1/4" x 3/16" (6 mm x 5 mm) V-notched trowel or the Schluter®-KERDI trowel, which features a 1/8" x 1/8" (3 mm x 3 mm) square-notched design. 3. Using the flat side of the trowel, firmly press the 5" (127 mm)-wide Schluter®-KERDI-BAND into the mortar to ensure 100% coverage and to remove excess mortar and air pockets. 4. At all wall junctions, apply KERDI-BAND as described in steps 1-3, ensuring a minimum of 2" overlap on to DITRA/DITRA-XL. Notes: KERDI-BAND must overlap DITRA and DITRA-XL at seams and at floor/wall transitions by a minimum of 2" (50 mm) in order to maintain waterproof integrity. In some applications the vertical section of the floor/wall transition will not accept a bond to Schluter-SET, Schluter-ALL-SET, Schluter-FAST-SET, or unmodified thin-set mortar. Connections to such elements can be achieved using Schluter®-KERDI-FIX or suitable trowel-applied waterproofing materials, such as those that require atmospheric moisture to cure (e.g., urethane sealant). 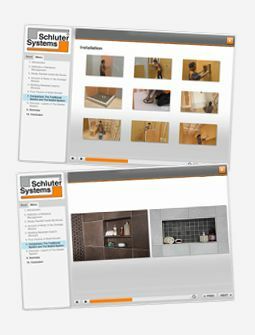 For complete installation guidelines and warranty criteria please refer to the downloadable Schluter®-DITRA Installation Handbook and view the step-by-step installation videos available below.